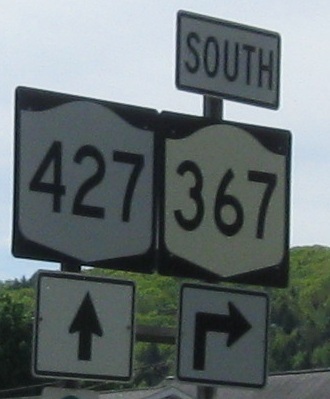 Starting in Southport, although neither of these reference markers is for NY 427 and there are no state highways at this junction of Cedar St. and Pennsylvania Ave. Let's take a closer look. Pennsylvania Ave. was obviously once NY 14, and that's because 14 was moved onto Clemens Center Parkway (I go into more detail on the 14 page, linked at bottom). 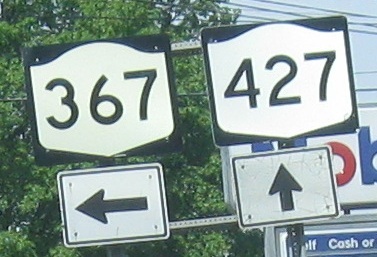 Maple Ave. was obviously once NY 379, but it's on the NY 427 page for some reason. 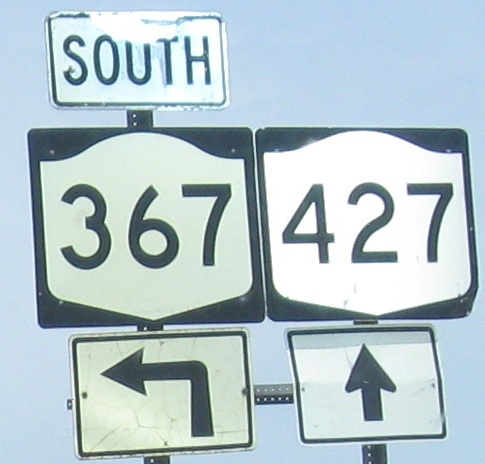 That's because NY 427 was rerouted off of Maple Ave., which met old 14 just before downtown Elmira, and onto NY 379 toward Southport instead, except ending at modern NY 14 instead of the original route. The one positive of doing so is concentrating traffic on Clemens Center Pkwy. 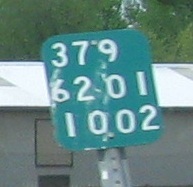 and keeping it off of city streets, but NY 17 (now I-86) already was taking the lion's share of traffic off of 427 by then. 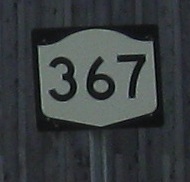 More traditional (older) reference marker on Cedar St. WB while it's still NY 427. Looking south and north along Seeley Creek. Older EB shields, but only for the side route. It should be decommissioned, because it barely lasts a mile before ending at the state line and becoming nothing in Pennsylvania. 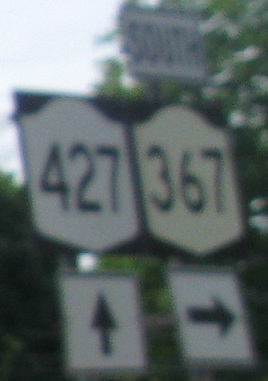 And WB - with the sun behind me, the best way to tell the age of the NY 367 shields is by comparing their reflectivity to the 427 shields, and you get a bonus old arrow.